An early 20th century moonstone fringe necklace, designed as a series of graduated oval moonstone cabochons, suspending an oval and circular moonstone cabochon fringe, to the belcher-link chain. 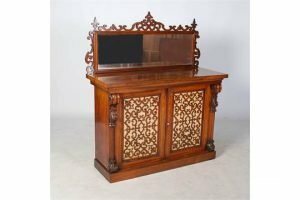 A Victorian rosewood mirror back chiffonier, the rectangular mirror plate within a pierced scroll border, above a rectangular top and pair of panelled cupboard doors with pierced fret work panels over fabric, enclosed by scroll and foliate carved columns, on a plinth base. 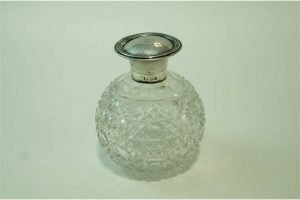 A silver topped scent bottle, the globular hob nail cut body with a hinged cover, with stopper. 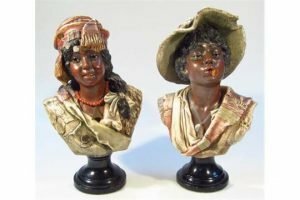 A pair of 19th Century Continental Blackamoor earthenware busts of a lady and gentleman, she in elaborate headdress, he in hat, smoking pipe, quarter profile on ebonized bases. A late Victorian ladies diamond ring, florally set with nine diamonds on a yellow metal part pierced shank. 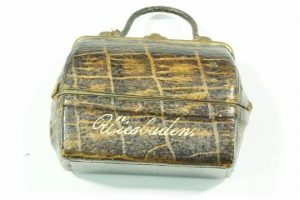 A 19th century travelling inkwell in the form of a Gladstone bag. 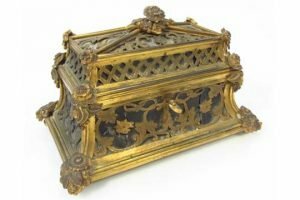 A 19th Century Tahan of Paris jewellery casket, the gilt metal and ebonized rectangular outline set with a domed lid with floral and leaf knop, with a blind fret scrollwork on black ground, hinging to reveal a part velvet lined interior on an inverted base with orb feet headed by relief cast flower heads, signed to the hinge. 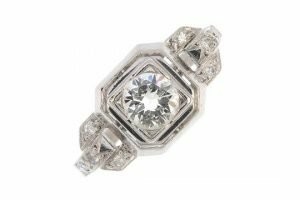 A diamond dress ring, the brilliant-cut diamond within a square-shape surround, to the single-cut diamond geometric shoulders and plain band. Estimated total diamond weight 0.45ct. 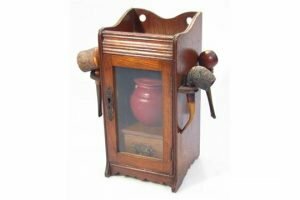 An early 20th Century oak smoker’s cabinet, the rectangular body with a part pierced upper galleried top, fronted by a glazed door hinging to reveal a mixing bowl and drawer, flanked by compartments for pipes and set with three various pipes. 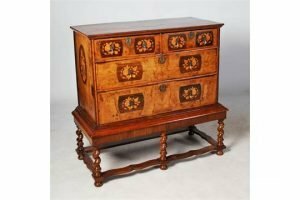 A William & Mary walnut and marquetry chest on stand, the rectangular top with a central oval inlaid panel of flowers and foliage within a herringbone inlaid border, above two short and two long graduated drawers, on a base with five barley twist supports and bun feet united by stretchers. 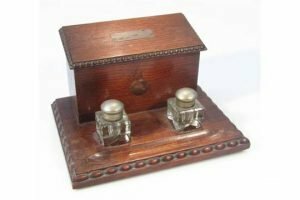 A 1930’s oak desk tidy, with hinged lid revealing a fitted interior, fronted by two removable glass inkwells and spaces for pens, with a bead outline. 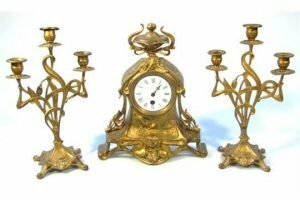 A 20th Century Art Nouveau design gilt metal clock garniture, the enamel dial with Roman numerals revealing a key wind movement fitted in a highly elaborate gilt metal case, surmounted by leaves and set with reeds, flower heads and stalks, flanked by two three branch candlesticks raised with further flowers with beaded dish holders. A 9ct gold amethyst bracelet, designed as a series of oval-shape amethyst collets, with gate link spacers, to the tapered terminals and padlock clasp. Hallmarks for Sheffield. 23.6 grams. 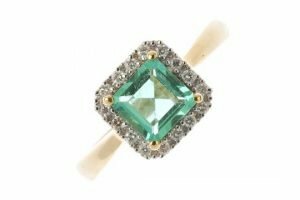 An emerald and diamond cluster ring, the square-shape emerald, within a brilliant-cut diamond surround, to the plain band. Estimated total diamond weight 0.10ct. Hallmarks for Sheffield. 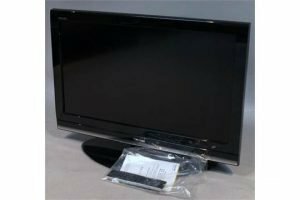 A Toshiba Regza 32″ colour Television, in black trim with accessories. 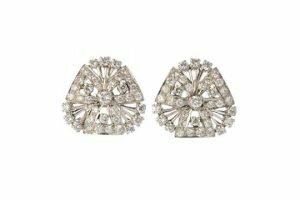 A pair of diamond earrings, each designed as a brilliant-cut diamond openwork cluster. 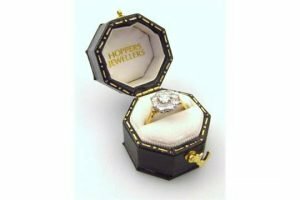 Estimated total diamond weight 1.10cts. 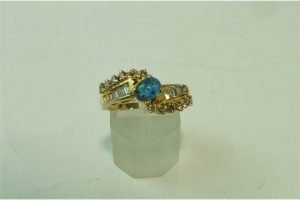 A sapphire and diamond ring, the cabochon flanked either side by five baguettes and six small brilliant cut diamonds to each shoulder. 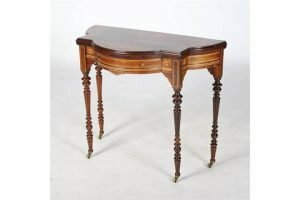 An Edwardian rosewood and marquetry inlaid demi lune card table, the shaped hinged top opening to a baize lined interior, above a single frieze drawer, raised on tapered cylindrical supports with fluted detail, resting on brass castors. 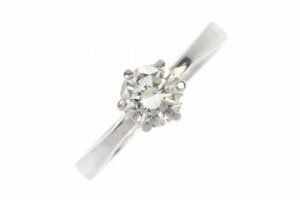 An 18ct gold diamond single-stone ring, the brilliant-cut diamond to the plain band. Estimated diamond weight 0.75ct. 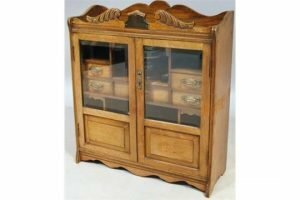 An Edwardian oak and beech smoker’s cabinet, the upper section with a broken scroll pediment above two partially glazed doors, hinging to reveal a ceramic mixing bowl and an arrangement of open drawers and pigeon holes, raised above a shaped apron base.